Updates, almost every form of software has updates. Updates are usually a useful thing to have. Most help make the software or hardware more secure and run smoother. Microsoft puts out a new update every month for their operating systems. So the question is should you update all the time? Updates can sometimes conflict with older software or even new software. I updated my HP at home one month, and the update wiped out my sound, I had to roll back to a previous version and wait a month until the proper drivers were released for my sound card. 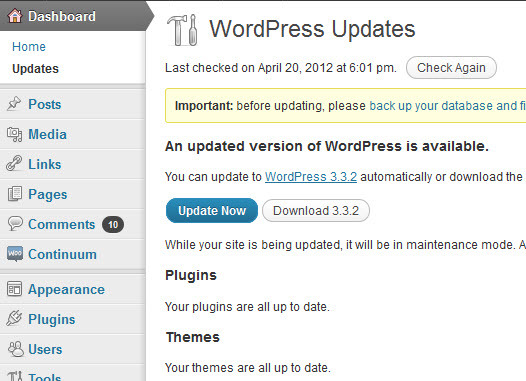 Those of us familiar with WordPress, knows that the plugins and WordPress it’s self seem to be always updating. There again, on one update of WordPress, it conflicted with a gallery plugin I had. So updates are not always bug proof. There are some steps you can take to ensure a more seem less update. The first rule in all of technology is BACKUP. Back Up, Back Up, Back Up! Did I mention Back Up? There is a reason the Microsoft Notification box in the lower right corner is always asking you to back up your copy of Windows. After backing up, testing is the next important step. Test everything, all your plugins and widgets, test your site in all the different browsers as well, make sure your site or software is running the same way it was before the update. The third tip would be to read up on the update. Every new update release has some form of information about it, read what other people are saying about it. If a certain update is blanking out other peoples websites you may want to stay away. Like I said, updates are there to enhance and improve your software, but there is no way to account for every situation there is, so try to be careful when updating your stuff!